Why does my cat scratch the carpet? Why does my cat scratch the carpet? People often think cats only scratch on vertical surfaces, but they are equally keen to scratch on horizontal surfaces. 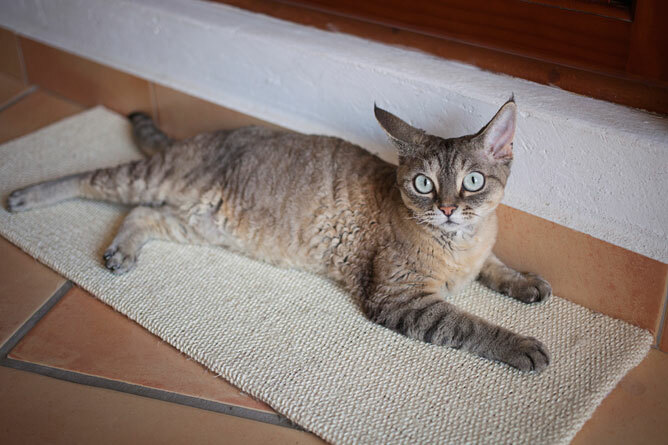 Find out why your cat is scratching at the carpet. Cats scratch to sharpen claws, to stretch muscles after resting and to leave scent marks. People often think that cats only scratch on vertical surfaces, like posts, but they are equally keen to scratch on horizontal surfaces. The best way to prevent carpet scratching is to make a horizontal scratch pad that provides the same sensations as clawing at carpet. Just get some carpet and underlay that is similar in texture to the carpet the cats are currently clawing. Fix the underlay to a heavy piece of board (at least 2cm thick) and the carpet over the top of that. Fit spiked carpet savers on the underside, so that when the board is on the carpet it won't slide as the cats claw it. This board should be big enough to cover the area of carpet the cats are clawing. It'll be more attractive to your cats if it looks like it's already been used, so make rake marks on the carpet pad with a wire brush. Once they're in the habit of using it, you may be able to move it to a location where it is less unsightly. Advice given by behaviourist Jon Bowen.